It’s back! It’s finally back! 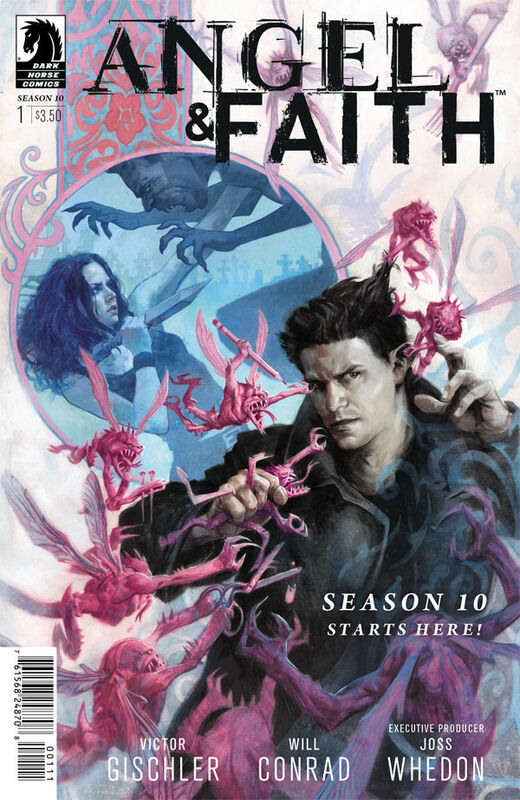 The Angel & Faith series continues today with issue #1 of Season 10. I previously reviewed the first 25 issues of Angel & Faith, which were part of Season 9 in the Buffyverse. Victor Gischler and Will Conrad are taking over the series from Christos Gage and Rebekah Isaacs, who have both been moved over to the Buffy team. I’m not sure how I feel about this yet, so keep your eyes on my future reviews. So far, the writing is very comfortable and familiar territory for any Angel fan, with laughs, backstory, and sadness woven into one engaging story. Also, file this issue under: things I didn’t see coming. Because whoa. Besides Angel’s dorky humor and terrible luck, there’s also Faith’s story. As we all know, Faith is at her best when she’s far away from Buffy. How will this reunion affect her? Is she finally mature enough to get over her Buffy envy? As a side note: I really love how seamlessly Buffy Season 10 #1 and Angel & Faith Season 10 #1 are woven together. If you’re reading both (which I recommend), you’ll even notice a few pages where the same scene is happening, just from a different perspective. Very interesting. So, pick up this issue of Angel & Faith, and be sure you’re also reading Buffy, because all signs point to this being a wild ride.